Rest in comfort among this artistically inclined cotton blend duvet cover. This duvet cover is as light as a feather! 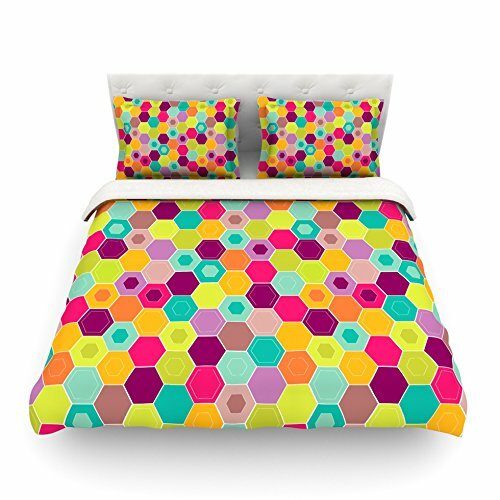 You will be sure to be the envy of all of your guests with this aesthetically pleasing duvet. We highly recommend washing this as many times as you like as this material will not fade or lose comfort. Cotton blended, this duvet cover is not only beautiful and artistic but can be used year round with a duvet insert! Add our cotton shams to make your bed complete and looking stylish and artistic! At KESS InHouse, we see home decor as a chance to add art to the home and to bring together a collaborative community of artists. Whether it's on the couch, in the kitchen or hanging from a wall, we believe that art enriches our lives and we want to support the artists who make it possible. For this reason, a percentage of every KESS InHouse sale goes back to the artist who created the design. KESS InHouse curates every piece of artwork specifically keeping in mind the product line. We pride ourselves on the quality and integrity of our company and home decor line. KESS InHouse believes artists should be rewarded for their creativity, imagination and ability to transform a blank surface into something remarkable. We would like to invite you to join us in our fight against blank walls and creatively lacking homes.